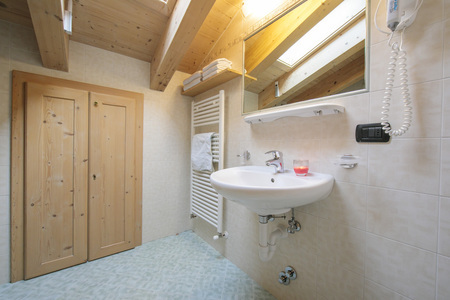 Take to the slopes of Livigno and the nearby amenities of town, from this modern loft-style retreat! 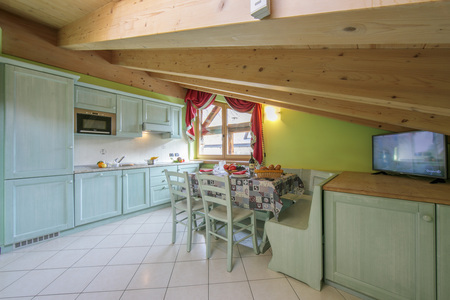 Situated a short stroll away from the Gondala lift (200 metres) and shuttle stop (10 metres), this flexible 2nd floor apartment offers a laid-back holiday space for families and groups of 5. Inside, the apartment enjoys a romantic loft-style ambience and charm. The open plan living space with exposed sloped ceiling benefits from free WiFi access, a modern kitchen diner and a double sofa bed with flat screen SAT TV. A master bedroom offers the same restful ambience and comprises of a set of twin joinable beds and single bed. A contemporary fitted shower room completes the layout of this homely retreat. 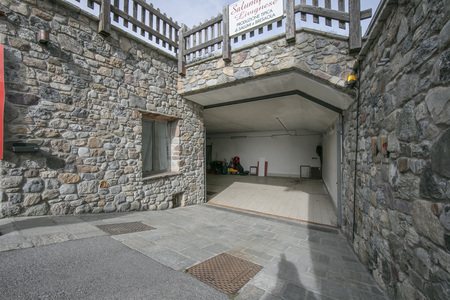 A ski storage room and optional private garage (EU 50 per week) provide added convenience. The shuttle stop is just 10 metres away, whilst the Cassana gondala is 200 metres away. At the end of a day’s skiing, it is possible to arrive by skis just 20 metres from the residence. Due to its accessible resort location, a car is not necessary. 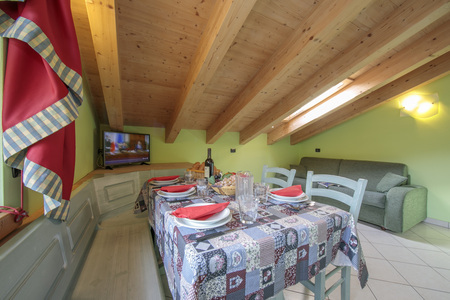 The small-scale residence is also ideal for larger groups looking to stay; with guests also able to rent the ground floor apartment ‘Sassella App. 2’ (ID 3370) which sleeps 7, the 1st floor balcony apartment ‘Chianti Appt. 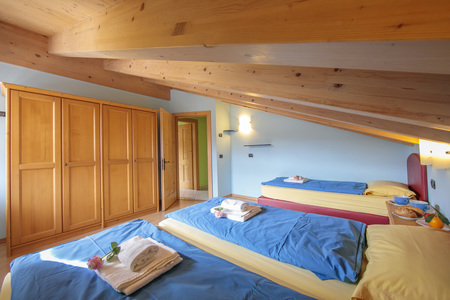 4’ (ID 3371) which sleeps 4 and the 2nd floor ‘Valtellina App. 8’ ID 3373) which sleeps 4. Sleeping- Bedroom 1: A versatile family room with twin joinable beds, an extra single bed & wardrobe Extra: A double sofa bed features within the living room Bathroom- Bathroom 1: A spacious modern suite with shower cubicle, wash basin, WC & bidet Additional- • Free WiFi access • SAT TV • Central heating • Hairdryer • 32 external steps • Ski boot heater • Ski storage • Pets allowed (EU 50 per week) • Garage parking (EU 50 per week) Location- The chalet residence is situated along ‘Via Canton’ in Livigno; placing guests within convenient reach of the shuttle stop (10 metres away), Cassana gondala (200 metres away) and a small nearby supermarket. 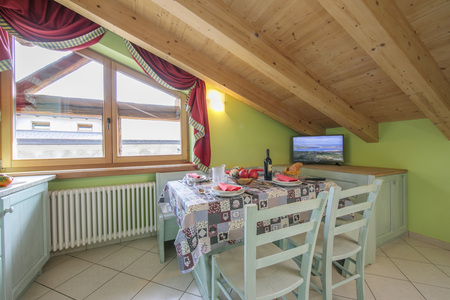 After a day on the slopes, it is also possible to arrive on skis approximately 20 metres away from the residence; for that convenient ski-in feel! Just 7 minutes’ drive away, the year-round Italian Alps resort of Livigno boasts an extensive range of restaurants, cafes and bars to complement a self-catering holiday, alongside live music venues and tax-free shopping opportunities. Offering a strong family-friendly appeal, the Livigno also offers a host of leisure pursuits and activities for all age groups to enjoy. Perfect for winter sports, Livigno is home to one of the best Snowboard parks in all of Europe, as well as a great Ski school and a fantastic range of Ski runs; perfect for all ages and abilities. From Snow Go-karting, ice skating, zip wiring, horse riding and gym work outs to tree-top climbing at the Larix Park; there is also as much to enjoy off the Ski slopes! In the beautiful spring and summer months, hikers and climbers flock here. The Mottolino Bike Park (5 minutes’ drive away) offers a spectacular setting for cyclists too. For those looking to unwind after an action-packed day on the slopes or in the great outdoors, then the exclusive resort Spa promises the perfect indulgence.